17) 3 WAYS TO MAKE YOUR WORKSPACE WORK FOR YOU 20) WHY DOESN’T TRAINING WORK FOR YOU? It makes sense then to consult the tried and true practices in matchmaking that help those professionals find the right people for each other, and see if any of them could also apply for matching your clients with their dream home. You’ll find that these 8 dating rules may just show you the secret to matching your clients with the perfect home. back to the store if you’re not happy with your new home. It’s best to first help your client get prequalified. This is a tangible step that shows they are ready to move on to a new home. You want to make sure they are completely over their love affair with their previous home. You can even ask them for a sign or proof that they’re ready to move on. When a person is looking for a mate, it is a waste of time for them to even consider those potential mates that are clearly out of their league. These people won’t even stop to give them the time of day. In the world of real estate the idea is the same. There is no point showing your clients houses that they can’t afford and will simply lust after without having any real chance of purchasing the house. It is your job to keep your client ground in reality, and help them be realistic in terms of price when choosing their next home. When trying to manage the many pitfalls of online dating, on inevitably goes on a date where the other person looks nothing like their picture online. That can be just as big of a problem when looking for a house. When clients show you a particular house they want to visit, ask them to name something about the house that they like other than the aesthetics. This way you can see if they are simply infatuated with the way the house looks in those pictures, or if there is a deeper interest in the home that could become a deeper connection between your client and the house. mitment, and don’t let their excitement push them into making a rash decision. It is your job to keep them grounded in reality. Push for your clients to do an inspection to make sure the house isn’t hiding any dark secrets. Sometimes the most charming facade can hide tons of slime and deadly mold. Follow Your Heart (or Gut) People often laugh at and ridicule the idea of love at first sight, but when it comes to homes, the phenomenon can certainly happen. Your client may just find their perfect dream home at the very first place you take them. If you have a client that does insist this is the case, then you don’t want to try and rationalize with them or talk them out of their decision. You do, however, want to make sure you are watching out for their interest and make sure your clients take all the necessary precautions before they jump in headfirst. Celebrate the Happy Union! When a couple gets married they tend to throw a big party and celebrate their union. The same goes for the closing. Your clients have just essentially married the house of their dreams, and now it’s time to rejoice. Congratulate them on their new union. Show your support for their new homeowner status by going to their housewarming party. Help Your Clients Maintain Their Dream Home & Ensure a Lifetime of Happiness You can’t just disappear after the transaction is finished. Become their realtor for life by showing your clients how to maintain their dream home. Act as their resource for other professionals they may need to maintain the house such as handymen, plumbers, electricians, etc. Show them how to keep up with home maintenance so they don’t ignore problems that surface and end up with a much larger issue than they started with. Help them make sure their dream home lasts so they can live happily ever after in their home for a lifetime. 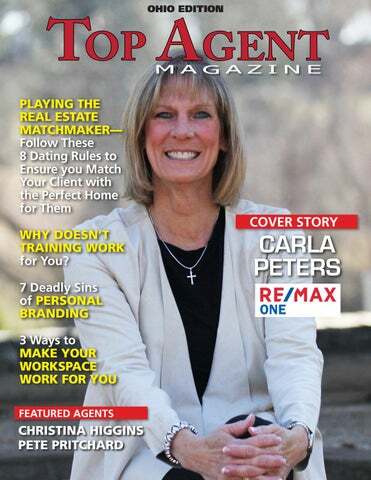 Based in Pickerington, Ohio and a member of the RE/MAX Hall of Fame since 2012, Carla Peters has also been a Five Star Agent in Central Ohio since 2014.
and they don’t care for sudden changes in procedure or lifestyle. They also like activities they can start and finish. Compliants are thinkers. They’re always wondering how things work. They want practicality, logic, fairness and a systematic approach. When talking to thinkers give facts, documentation and data. They seek accuracy. They’re motivated by standards of high quality, limited social interaction, detailed tasks and logical organization of information. some personality assessment tools can cost thousands of dollars, but at Corcoran Coaching, we’ve opted for a much more affordable offering: a free DIsC assessment. Just visit www.corcorancoaching.com/behavioralstyle. php and you’ll be guided through a quick questionnaire to learn your own What is a style ‘personal Just likeothers com- as sistently dominant andbrand’? how to read well. (across all marketing platforms), pany or product branding, it’s built around a well-defined brand can elevate agent recimaging and messaging that is designed to ognition and help to establish credibility Yes, understanding people, listening to their needs and wants and responding create a feeling. And in the case of personal and authority. However, when executed appropriately all takehow work But because realare estate is a people branding, it influences you and wantattention. others incorrectly, the effects lackluster at best, business, it’s simply a must. And the better at it you become, the to feel about you. From your photos to other and harmful at worst. To help you better avoid living as an or broker. brandyou’ll images,make elements andagent even content, theI promise. pitfalls of personal branding, we’ve there is a lot that goes into creating your compiled a list of what we feel are the 7 unique brand.to Displayed Best of luck you! correctly and con- deadliest sins. ‘brand’ stands out to me? What lets me know that one of them is uniquely positioned to serve my needs? and they don’t care for sudden changes in procedure or lifestyle. They also NO FOCUS like activities they can start and finish. In business, you can’t be all things to all side of your specific focus. That would be people. Many have and failed. In or- always quite difficult. It does mean over work. time Compliants are tried thinkers. They’re wondering howthat, things der to have business and brand, doneacorrectly), you approach. will do moreWhen and They wanta successful practicality, logic, fairness(ifand systematic you must define yourfacts, ideal custommore ofand the data. exact They kind ofseek business you talking toclearly thinkers give documentation accuracy. er and how you will super-serve that cus- want, and conversely, even stop doing They’re motivated by standards of high quality, limited social interaction, tomer. In other words, declare and develop the kind of business you don’t want. And detailed tasks and focused, logical itorganization of information. a specialty. By being does NOT that’s what a great brand is designed to mean that you stop doing all business outaccomplish. some personality assessment tools can cost thousands of dollars, but at Corcoran Coaching, we’veNO opted for a much more affordable offering: a free AUTHENTICITY DIsC assessment. Just visit www.corcorancoaching.com/behavioralstyle. Recognizable personal brands can be very You should be able to ‘breathe your brand’ php and you’ll be guided through a quick questionnaire to learn your own clever and memorable, but if your brand in everything that you do. This is importdominant andlast. how to read as well. isn’t ‘you’,style it won’t If you try toothers put ant not only for your customers, but perout a persona that is different from your haps most importantly for you. There is Yes, needs and wants responding ownunderstanding and the way you people, live yourlistening life, peo- to their a tremendous amount of and confidence that ple will take notice overwork time. and The attention. most comes knowing youisare who appropriately all take Butwith because realthat estate a people incredible it’s personal brands weaveAnd pro-theyou portray, that become, you have the business, simply a must. better at itandyou thehabits, better fessional and personal intoorone. 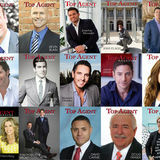 inspiration, knowledge and expertise to living you’ll make asqualities an agent broker. I promise. Your brand becomes an extension of you. back it up. You can have a2015 recognizable memocards, postcards, brochures, etc. Other peoCopyright©, Bubbaand Mills. All rights reserved. NO CONTENT The ultimate goal of personal branding is comfortable producing is the key to keeping to become known as an authority in your it simple. No one wants to be bogged down andchosen they niche. don’t That caremeans for sudden or lifestyle. They also withprocedure producing content. But on the flip side, that youchanges must in likedemonstrate activitiesthe they can start and finish. knowledge, expertise and/ no one knows how much you know until or experience to back up your position. you share it. Great content demonstrates your knowledge and how helps your customers Content that are best expresses youThey’re and your always Compliants thinkers. wondering things work. at the same time. In addition, it serves anbrand could be as simple as a series of They want practicality, logic, fairness and a systematic approach. When other purpose with search engine optimizaphotos, quotes, e-books, video shorts, etc. talking to thinkers give facts, documentation and data. They seek accuracy. Choosing the type of content you’re most tion and attracting prospects online. move prospects one step closer to becoming customers.